Wolves slipped to a fifth straight defeat as Bournemouth took advantage of Rajiv van La Parra's second-half red card to come from behind at Molineux. Loan striker Danny Graham's deft header gave Wolves a half-time lead. But Van La Parra's 59th-minute dismissal following a 50-50 challenge with Steve Cook transformed the game. Harry Arter levelled, then Matt Ritchie blasted home from 15 yards before Wolves ended with nine men when Matt Doherty was sent off too. Referee Mike Jones' performance had angry Wolves owner Steve Morgan remonstrating with him on the pitch at the end. Bournemouth, now unbeaten in 11 games, had 11-goal top scorer Callum Wilson fit to return, while Wolves made four changes to the team hammered 4-0 at Brentford last weekend. Dominic Iorfa came in for his Wolves debut at right-back to replace the injured Scott Golbourne, while club captain Sam Ricketts and midfielders Lee Evans and George Saville were left out, instigating recalls for Richard Stearman, James Henry and Kevin McDonald. Wolves dominated the first half and took a deserved lead on 41 minutes. James Henry curled in a near-post left-wing cross and Graham's delicate header drifted in just inside the beaten Boruc's left upright. Eddie Howe, now Bournemouth's manager, was in the last Cherries team to visit Molineux in September 1998. He was also part of a winning side that day, Mark Stein scoring twice in Bournemouth's 2-1 League Cup win, with Robbie Keane netting the Wolves goal. Bournemouth started the second half more brightly, Pitman testing Carl Ikeme with a fierce low free-kick which the Wolves goalkeeper did well to hold onto. But then came the game's main talking point when Cherries defender Cook went down heavily after an apparently harmless, fully committed collision with Van La Parra - and referee Jones quickly brandished a red card. Within 14 minutes, Arter had levelled, then Ritchie fired home through a crowded box after Pitman and Wilson had both been denied by tremendous saves from Ikeme. Doherty was then shown the red card for a late challenge on Brett Pitman, sparking an incident which had players from both sides squaring up to each other. "I spoke to all the officials and the information I got was that Van La Parra was deemed to have led with his elbow, which was why he was red-carded. I felt at the time that it was head to head, as I still do, having seen it, that it was accidental. "The second sending-off was equally hard. Matt won the ball with his first leg and his second leg was passive. "You are allowed to appeal and, on both fronts, we will appeal." "The sending-off was a key moment in the game. Cookie came back in the dressing room with a bump on his head. He was definitely caught. Whether the lad deliberately made contact is the question. "But, even before the sending-off, I felt we were the better team in the second half. "You can understand the home fans' frustrations when they've been one up, had two men sent off, then ended up losing." Match ends, Wolverhampton Wanderers 1, Bournemouth 2. Second Half ends, Wolverhampton Wanderers 1, Bournemouth 2. Attempt missed. Brett Pitman (Bournemouth) right footed shot from outside the box is high and wide to the left from a direct free kick. Matt Doherty (Wolverhampton Wanderers) is shown the red card. Brett Pitman (Bournemouth) wins a free kick in the defensive half. Michael Jacobs (Wolverhampton Wanderers) wins a free kick on the right wing. Substitution, Wolverhampton Wanderers. Leon Clarke replaces Bakary Sako. Goal! Wolverhampton Wanderers 1, Bournemouth 2. Matt Ritchie (Bournemouth) right footed shot from the centre of the box to the bottom left corner following a corner. Attempt blocked. Callum Wilson (Bournemouth) header from the right side of the six yard box is blocked. Assisted by Brett Pitman with a headed pass. Corner, Bournemouth. Conceded by Danny Batth. Attempt blocked. 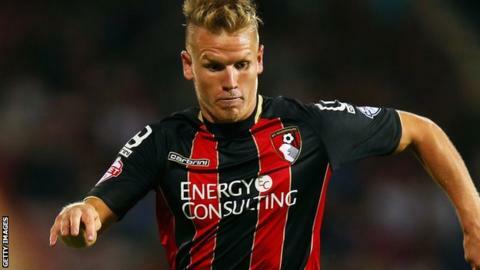 Matt Ritchie (Bournemouth) left footed shot from the centre of the box is blocked. Brett Pitman (Bournemouth) wins a free kick on the left wing. Substitution, Wolverhampton Wanderers. Liam McAlinden replaces Danny Graham. Attempt missed. Steve Cook (Bournemouth) left footed shot from the centre of the box is high and wide to the left. Assisted by Callum Wilson following a corner. Corner, Bournemouth. Conceded by Dominic Iorfa. Attempt missed. Andrew Surman (Bournemouth) left footed shot from outside the box misses to the right. Attempt missed. Callum Wilson (Bournemouth) right footed shot from the right side of the box misses to the left. Assisted by Simon Francis. Corner, Bournemouth. Conceded by Dave Edwards. Attempt blocked. Yann Kermorgant (Bournemouth) header from the centre of the box is blocked. Assisted by Simon Francis with a cross. Foul by Danny Graham (Wolverhampton Wanderers). Attempt missed. Simon Francis (Bournemouth) left footed shot from outside the box is high and wide to the left. Assisted by Callum Wilson. Substitution, Wolverhampton Wanderers. Michael Jacobs replaces James Henry. Goal! Wolverhampton Wanderers 1, Bournemouth 1. Harry Arter (Bournemouth) left footed shot from outside the box to the bottom left corner. Assisted by Andrew Surman. Substitution, Bournemouth. Yann Kermorgant replaces Marc Pugh. Attempt blocked. Yann Kermorgant (Bournemouth) right footed shot from outside the box is blocked. Assisted by Simon Francis.